Editor’s Note: This is the first in a series of stories on how climate change is expected to affect the Great Lakes region. The planet got hot, fast. Each of the last three years were records in terms of mean global temperature over the past 150 years. On average, the Great Lakes region is two degrees warmer than it was in 1912, according to the Great Lakes Integrated Sciences Assessment, which is produced by the University of Michigan and Michigan State University. By 2100, average temperatures could increase by 11 degrees Fahrenheit. It’s rare, but the planet’s overall climate has changed rapidly in the past. Volcanic explosions and meteor impacts did the trick then. This time around it’s us. We’re using too many fossil fuels, which puts more greenhouse gases into the atmosphere and heats up the planet faster than before, according to the fifth assessment report from the Intergovernmental Panel on Climate Change. A rapidly warming planet introduces an array of impacts that swirl in uncertainty. While experts try to predict what to expect, nothing is set in stone. The challenges of predicting environmental impacts didn’t deter one magazine from making the attempt. Michigan came out of that exercise looking good. Popular Science produced a video last December that concludes that Michigan will be the best place to live in the United States in 2100. That’s because the state is among the areas likely to avoid the increasing threats of droughts, mosquitoes, hurricanes, floods and forest fires facing the rest of the country because of global climate change, according to the magazine. In the coming years, only parts of North Dakota, Minnesota, Wisconsin, Michigan, New York, Vermont and Maine would mostly avoid these threats. “We wanted to give a simple visual to show what some of the near-term consequences of global warming climate change will be,” said Peter Hess, the author of the story. Because we often think of climate change as something far off, we think it’s something our children will have to contend with, Hess said. Well, no. There will be significant effects in our lifetime. Is Michigan the place to weather the climate? Tough call. Michigan fares pretty well compared to other states, Andresen said. Throw in all of the potential problems, such as those mentioned in Popular Science’s video and look at the collective threats, Michigan historically does very well. But that doesn’t mean the Great Lakes region, or even the parts of the states mentioned in the video, are safe from problems of their own. Predictions concerning future weather events vary, but both Popular Science and Andresen agree, more extreme weather is coming. Experts predict erratic precipitation. That could mean flooding. It could mean droughts. Only time will tell. Among the questions needing answers: How will living things interact with their changing environment? 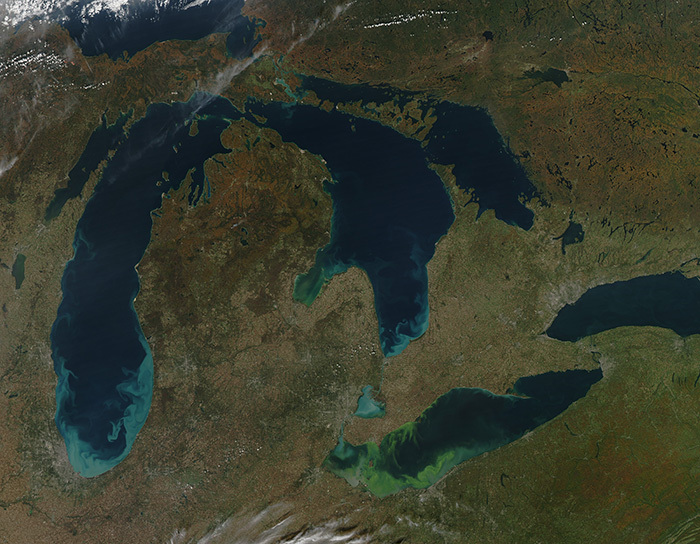 What will change with Great Lakes hydrology? Will there be longer growing seasons? And what will happen to tourism? Over the next few days, we’ll explore some of those questions. Tomorrow: Will the whole country descend upon Michigan in 2100? I am a single father of a wonderful 5 year old boy. I have seen the writing on the wall for 5 years concerning social issues and environmental issues. I have been looking for a place safe from police and intellectually enriching (to put simply social issues) but these posts scare me!!! Nothing but the ramblings of ignorant partisans!!! Harry, you will never actually change any minds or thoughts on the subject coming at people like that. I’m pretty certain you won’t even read this. Being childish and calling people names is ridiculous behavior and you probably only do so on the internet. Your claims come off as ignorant, foolish and won’t be taken with any credibility except by those which already agree with you. Joseph you are right and Lake Erie will not be the only lake that will become slimy What is really sad is that resources to clean up the Great Lakes will be eliminated in 2018. President Trump’s full budget request for the 2018 fiscal year still completely eliminates funding for the Great Lakes Restoration Initiative. Heartbreaking, so Michigan will be surrounded by fresh water that is polluted and not of much use.